iVeia’s Arcadia platform is ideally suited to the development of “embedded Android” products, low-power handheld and tablet products that differentiate themselves from typical consumer devices. With ample flexible I/O and peripheral expansion the Arcadia platform can quickly adapt to your product requirements improving time-to-market. 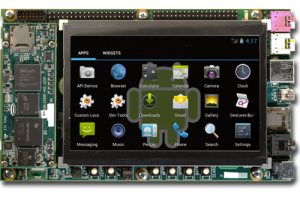 The Arcadia base board supports any of iVeia’s ARM-based Android-ready modules. Custom options are available.